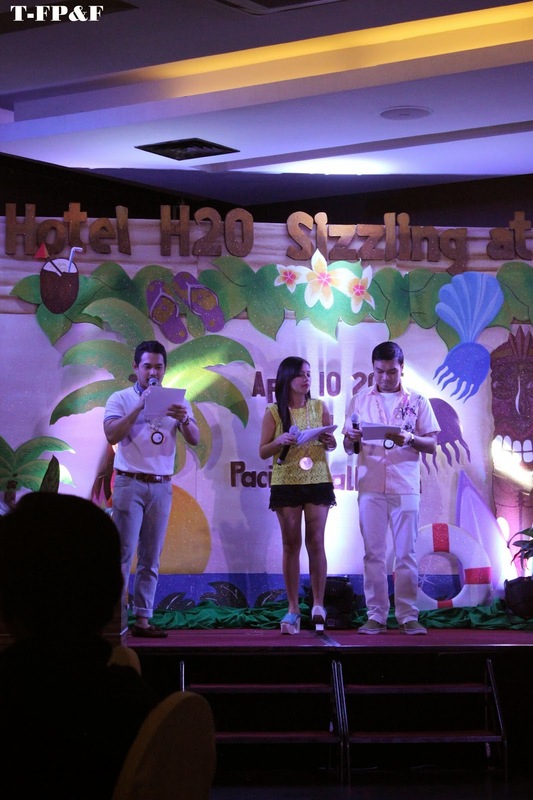 Last April 10, 2015, Hotel H20 celebrated their 5th year in the Hotel industry. That day, they invited media’s, their vendors, their partners, travel trade and all those people that became part of Hotel H20 through the years from the first day Hotel H2O started, over 250 guest attendees that night. Hotel H2O is located behind Quirino Grandstand, Luneta Manila same location of Manila Ocean Park. Hotel H2O is the first marine – themed integrated resort hotel in the Philippines. That night with other guest at the Pacific Ballroom, the place was decorated with Hawaiian themed. Some guest were able to have their souvenir photos in the photo booth with a so cool summer places background. Some guest were able to see also the huge aquarium that guest were able to see some marine species and what the unique thing is the tarpaulin of Hotel H2O. The event was hosted by known personality in radio and television, Miko Aytona, Lala Banderas and Rico Panyero. The event started with the open remarks of Hotel H2O General Manager, Lily Santos Adrid. Complementing this connection, Hotel H2O is also a four-star property with “first-rate rooms, amenities, outlets and service comparable to the finest deluxe hotels in the country,” added Ms. Adrid. Beyond the physical attractions, Ms. Adrid credited the hotel’s success over the last five years to two key people groups – its employees and industry partners. Recognizing the hard work of the hotel staff, Ms. Adrid cited two internal activities that brought out the best in the employees. These were the “Hotel H2O Got Talent” fun competition where the staff showed off their hidden skills and the “Go Green Innovation” contest where they contributed innovative ideas to make hotel operations even more environment-friendly. “They reinforce my belief that Hotel H2O’s best resources are, indeed, its people,” said Ms. Adrid. Awards were handed out to the top accounts comprising online booking portals, travel agencies, top corporations and government agencies. Finally, Ms. Adrid gave the audience a peek into upcoming projects of Hotel H2O and sister establishment Manila Ocean Park. The latter’s newest attractions, the Creepy Crawlies exhibit and Sea Life Park, are set to open later this year and in 2017, respectively. Both will create “new markets” for the park and hotel, said Ms. Adrid. Also, Hotel H2O’s parent firm China Oceanis Philippines, Inc. is on track to open a 400-room, five-star property in Makati City later this year. The new property, which took over three years to build, “adds a new dimension that complements Hotel H2O’s thrust,” said Ms. Adrid. Part of the event was giving awards to Hotel H20 partners for their top producer and excellence commitment. The guest was entertained by superb intermission dance number and love song serenade by Mico Aytona. The food was prepared by the Makan Makan Asian Food Village of Hotel H2O (https://www.facebook.com/pages/MakanMakan-Asian-Food-Village-Hotel-H2O-Manila-Ocean-Park/346240985389791?fref=ts&ref=br_tf), the food was really good event the dessert. They also have overflowing drinks either juice, coffee, wine, tequila and a lot more. They also gave an award for the outfit of the night (Male/Female) and Start of the night (Male/Female), and yours truly was chosen for the Male outfit of the night. And I was happy that night because that was my first time to get that kind of award. I would like to thanks Hotel H20 for inviting some bloggers like me in their 5th Year Anniversary Celebration and Hoping for the continued success of Hotel H20. Please check out also the video of Ms. Lily Santos Adrid on what are the upcoming projects for Hotel H2O.